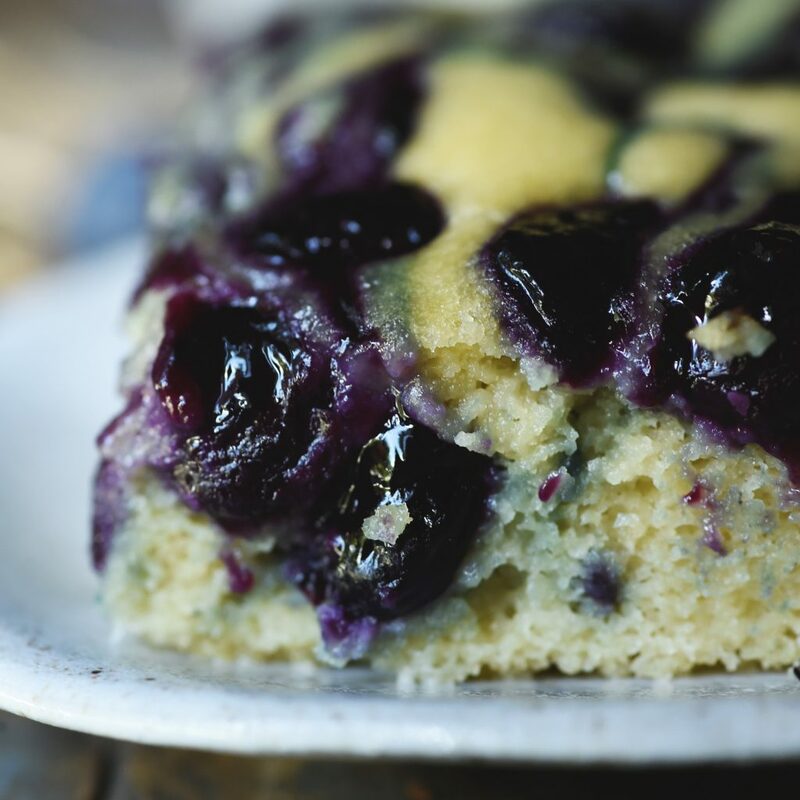 This Low-Carb Blueberry Almond Flour Coffee Cake boasts swirls of blueberry goodness. This recipe starts the day on a sweet note, but can still be part of a low-carb, keto, gluten-free, grain-free, Atkins, diabetic, or Banting diet. Sometimes I just want some sweetness with my bacon in the morning, and this recipe delivers. There is no jam or butter needed with this coffee cake. 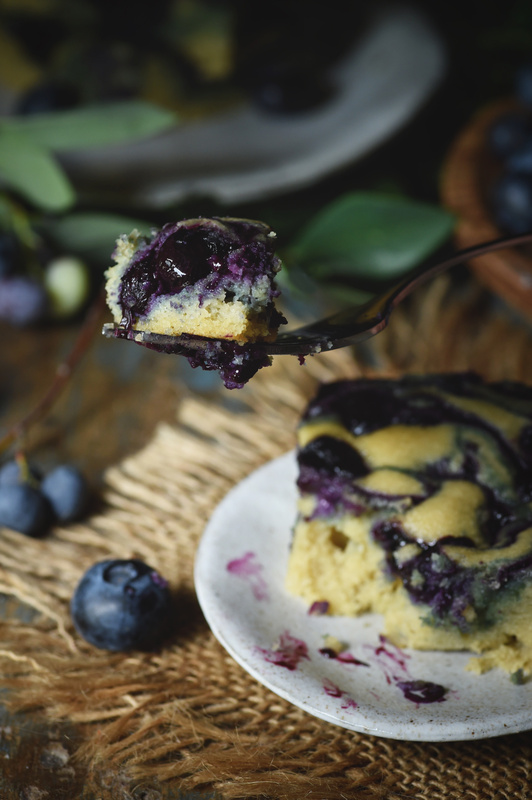 Jammy blueberries are swirled throughout the vanilla-scented cake. I added some bourbon to the cake, but this is optional. The cake is just sweet enough to satisfy a sweet tooth without being overly sweet. I used my food processor to make the batter for this cake. This makes the recipe quick and easy to get in the oven. 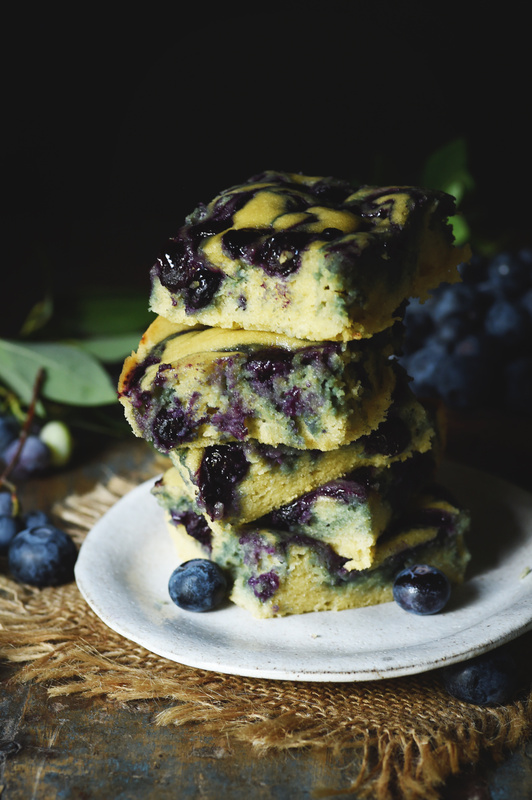 To manage my time, I start making the blueberry syrup and, as it simmers, I prepare the cake batter. 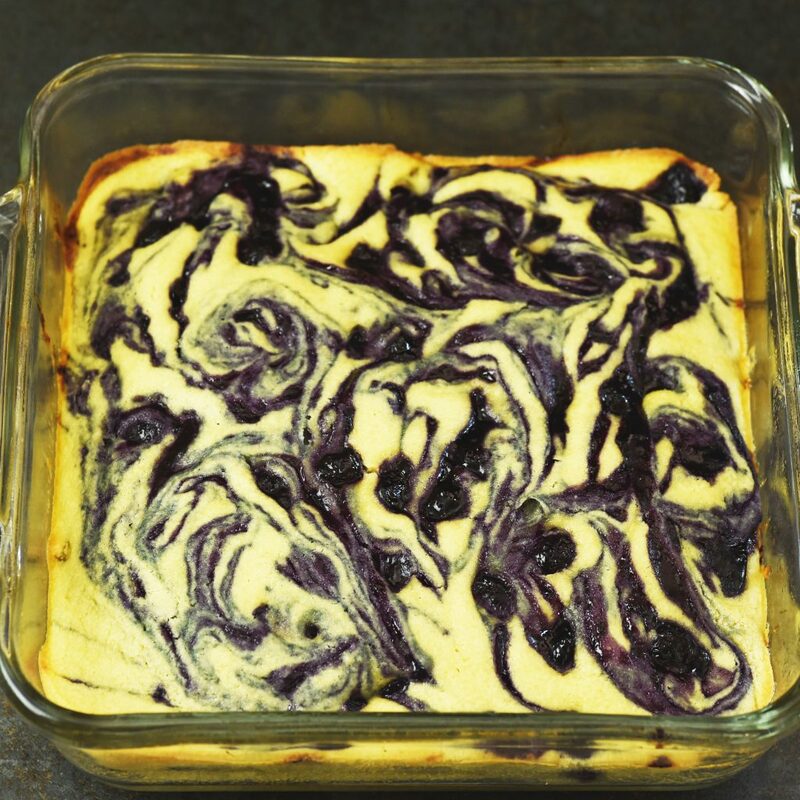 The swirls make this cake look amazing, but they are really made by just swirling a knife through the batter after the blueberry syrup has been added. So easy! This recipe is based off of my recipe for Low-Carb Strawberry Rhubarb Upside-Down Cake Recipe. I loved the cake in this recipe and feel that it complements fruity flavors well, without competing with them or overwhelming them. 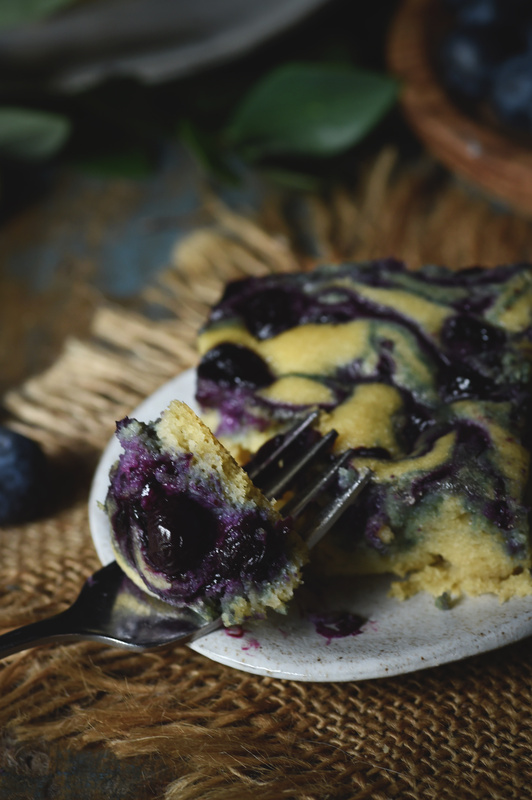 Since no food blog is complete without a blueberry coffee cake, I worked on this recipe and altered it to make this blueberry coffee cake. 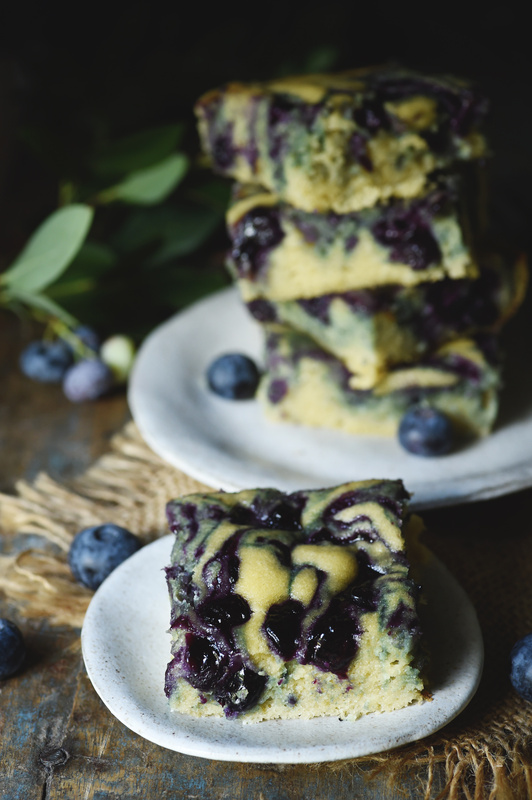 I contemplated adding a crumb topping to make it more like the coffee cake my mother used to serve at her table, but I loved the look of the blueberry swirls so much that I couldn’t stand the thought of covering them up. When I work on recipes, I generally make them in the afternoon because that’s when the light is best for taking photos at my house. I had planned on taste testing the first batch, then serving it for breakfast the next day. Unfortunately, not a single crumb of the cake was left for breakfast. I made the cake a second time to get additional photos. I decided I would serve it for dessert that night and have the leftovers for breakfast. After I finished taking the photos, I guarded the cake from sneaky fingers and hid it so it wouldn’t disappear for dessert. Okay, I admit I had a piece, but nobody knew because I took it out of the baking dish and arranged it on a serving plate, so the missing piece was less obvious. Besides, it’s important to know what a coffee cake tastes like fresh from the oven, right? Anyway, due to my hiding spot, (no, I’m not giving this one away) the cake managed to make it until dessert. Yet again, however, none lasted until breakfast. 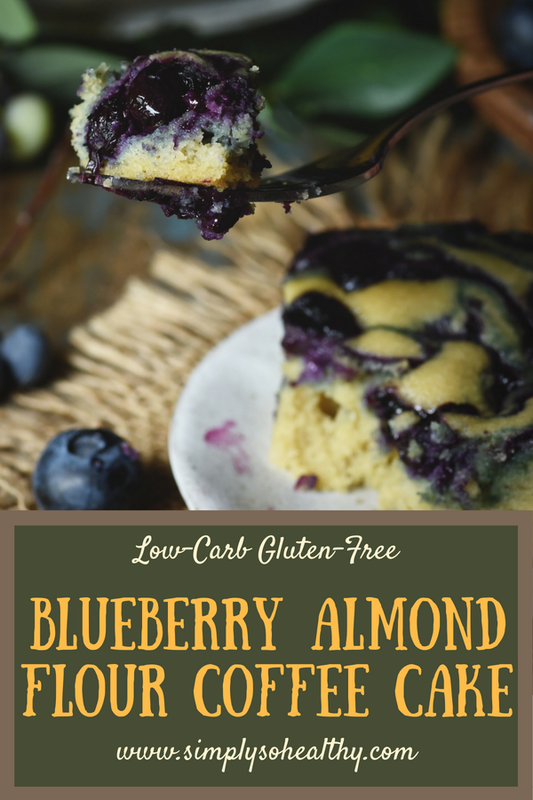 In any case, this low-carb blueberry almond flour coffee cake would make an awesome treat to enjoy with your morning coffee. Good luck with having it last that long! Enjoy! Preheat oven to 350º Fahrenheit. Grease an 8" x 8" glass baking dish. 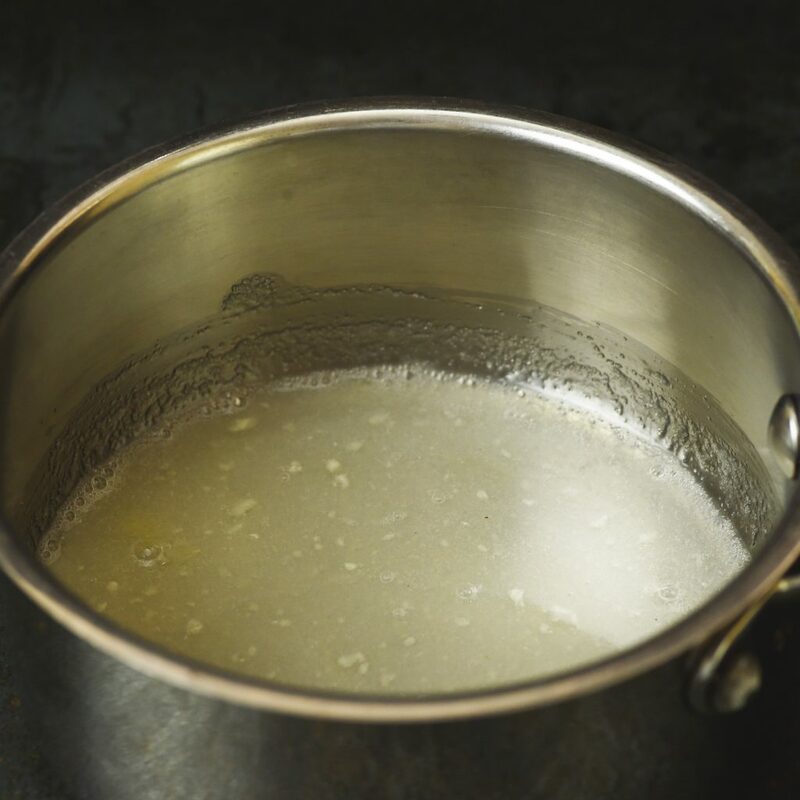 In a small saucepan, whisk together the erythritol/stevia blend, and the xanthan gum. Slowly add the water and the lemon juice while whisking. Stir in the blueberries. Bring mixture to a simmer over medium heat, then turn heat to low. Simmer, stirring occasionally, until the mixture has the consistency of a thick blueberry syrup. (about 5-10 minutes) Set aside. 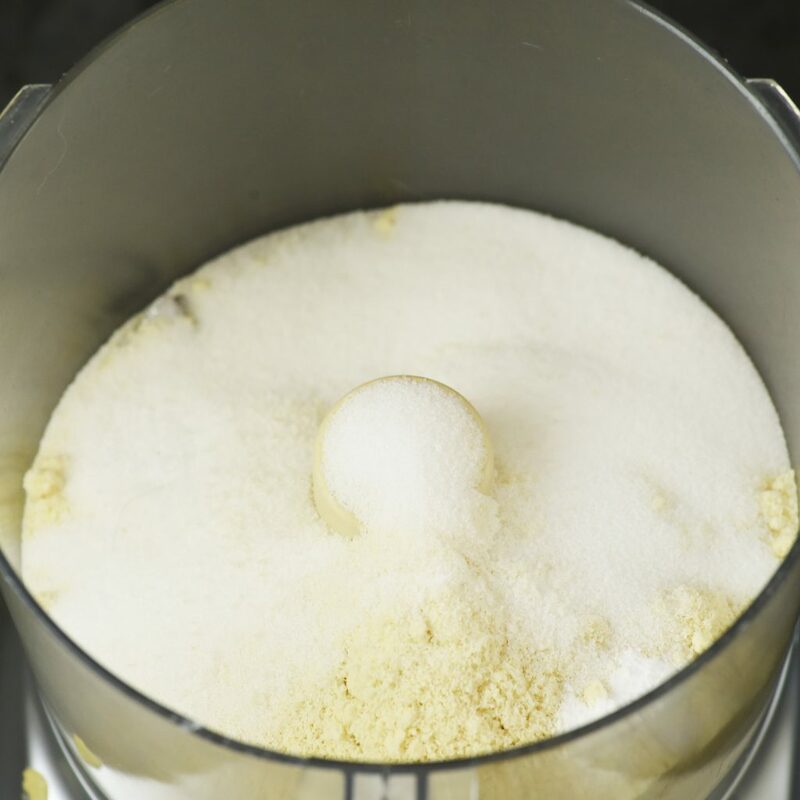 Place almond flour, granulated erythritol/stevia blend, baking soda, and sea salt in a food processor. Pulse a few times to blend. Add the butter or coconut oil and pulse again to incorporate. 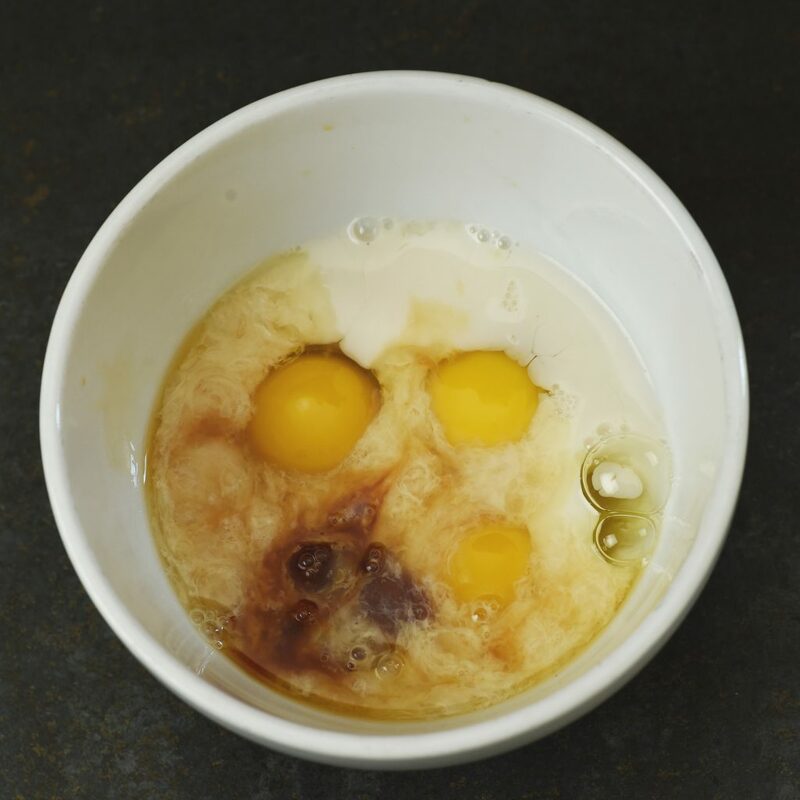 In a separate container (a large pourable liquid measuring cup works great for this), whisk together the almond milk, eggs, whiskey, and vanilla extract. Slowly add the wet ingredients into dry mixture in the food processor, pulsing after each addition. Pulse a few more times until batter is smooth. Transfer batter to the prepared baking dish. 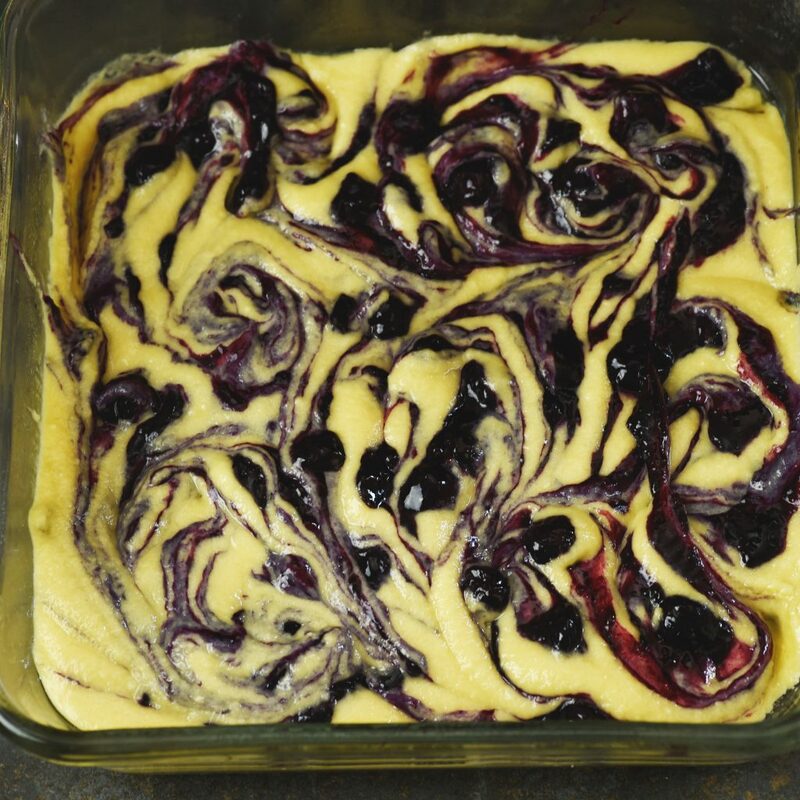 Spoon the blueberry syrup in stripes on top of the batter. 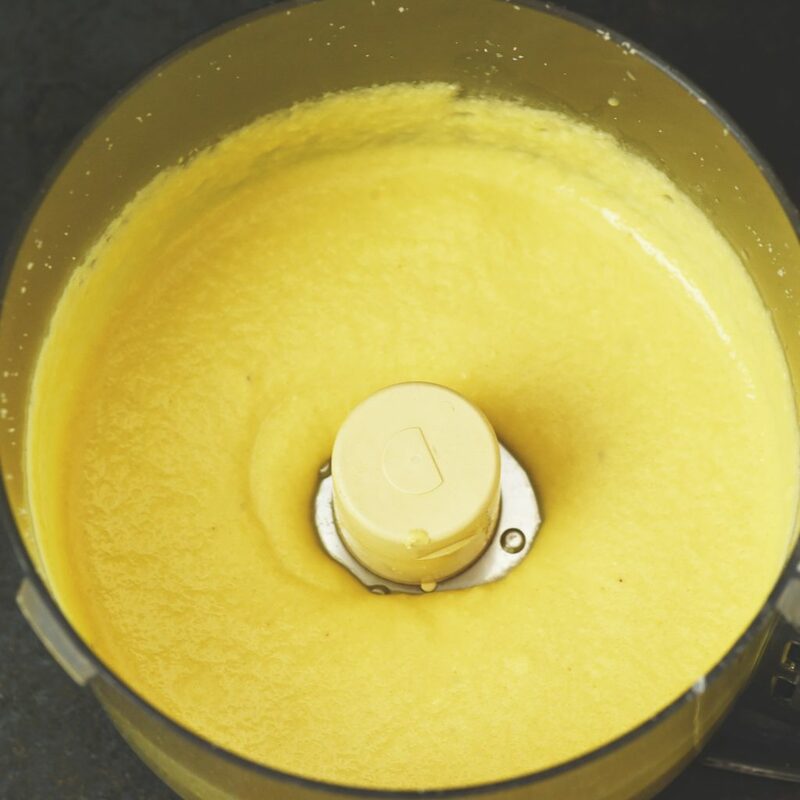 Using a butter knife, swirl the batter to create the desired pattern. Bake in the preheated oven for 23-28 minutes. Top should spring back when lightly touched. Cut cake into 9 pieces. Cover and refrigerate any leftovers. Hi, is it ok to use xylitol instead of stevia blend? The cake looks super yummy, can wait to make it! Sure! You may need to use more xylitol. My blend is about twice as sweet as sugar and I believe xylitol is around the same sweetness as sugar, so maybe about twice the amount. Let me know how it goes! What is the amount of almond milk necessary for the wet ingredients. I see the option to use 1 tablespoon instead of whiskey but is that all the almond milk required for recipe? It’s 1/4 cup of almond milk. Thanks! Hi this looks so yum! How much almond milk is in the batter please? Couldn’t see measuremenr. Thank you! I just picked 10 pounds of blueberries today. I went on line to find a recipe for my husband who is a type II diabetic and is really diciplined about not eatig sugars and keeping the carbs down. Oh my! 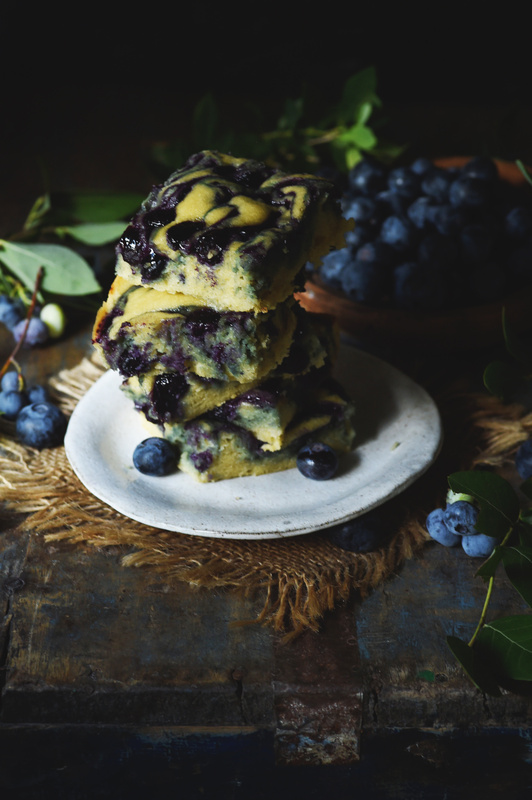 This blueberry coffee cake is delicious. You were right..we could easily devour this in one sitting (two of us), but,we won’t! Thank you so much for sharing this. It is exactly what we’ve been looking for. You’re welcome! I’m glad you enjoyed it. 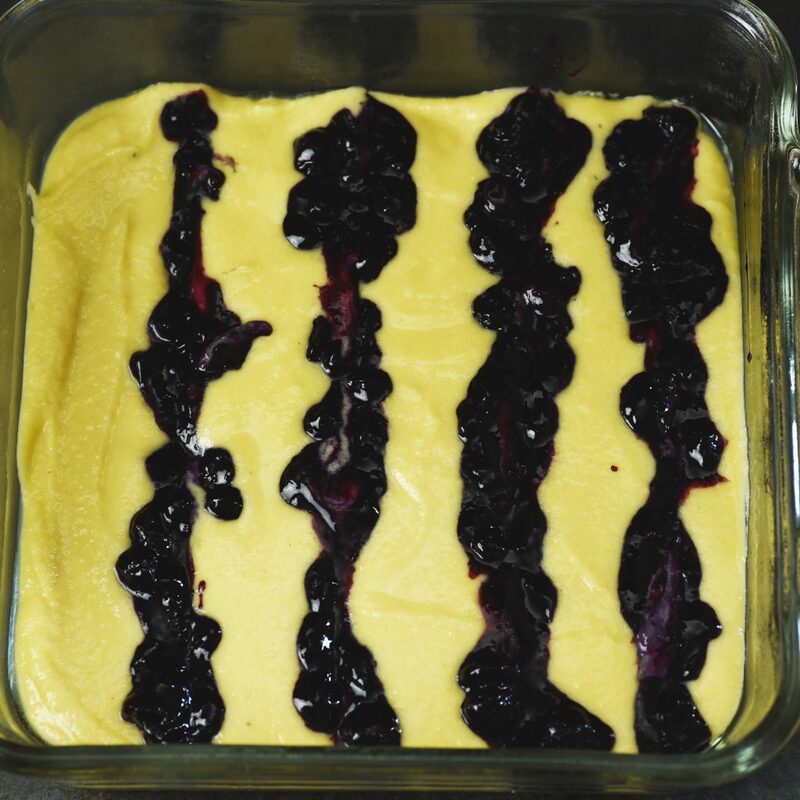 I also have a recipe for Blueberry Cobbler that you might enjoy if you’re looking for more blueberry recipes. Is there a simple substitute for xanthan gum? I don’t have any but want to try this. I think it could probably be left out of this recipe without making a huge difference. 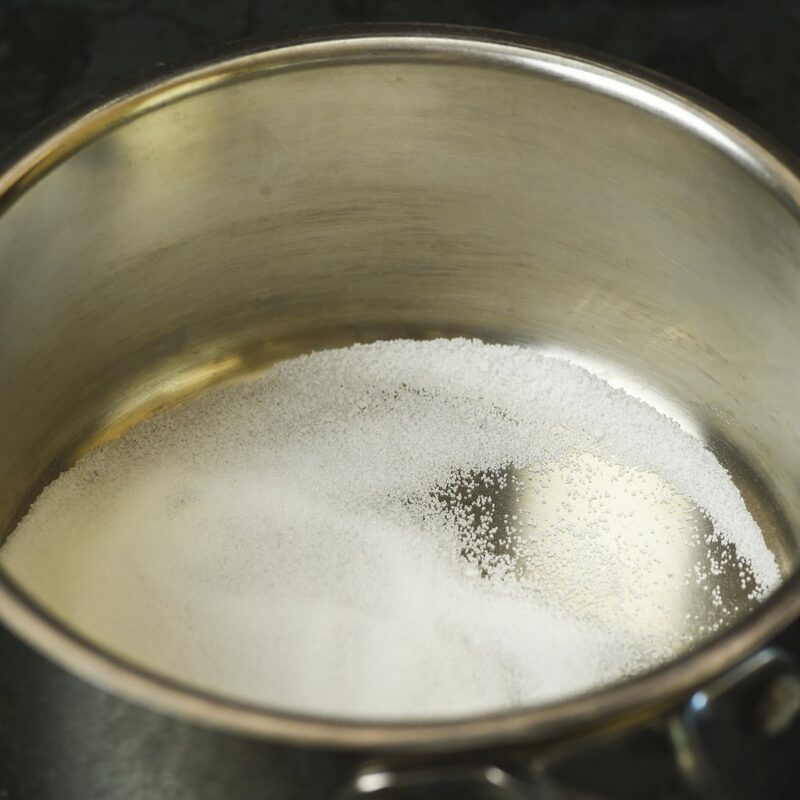 Xanthan gum is a substitute for gluten, so it helps hold in the bubbles as it rises. If you leave it out, it may not rise as much or hold together quite as well, but I don’t think it would be a huge problem. Absolutely delicious cake! My husband has just recently started a low carb diet, and he loves his sweets so I’ve had to try a lot of different low carb dessert recipes. This one is amazing! He loved it, said it didn’t have any weird textures or after tastes, and it’s extremely easy to make. I had no lemon juice so I substituted vinegar and it still came out beautifully. I made it for a ladies lunch, and it was a huge hit. Thanks so much! I really try to create foods everyone will love, whether they eat low-carb or not. Vanilla unsweetened almond milk should work fine. It will just be a little more vanilla tasting. If you want, you can decrease the vanilla just a tad, but I don’t think you will need to. I made this this morning and it’s in the oven. I used arrowroot in place of Xanthan. It looks so Yummy. Can I use regular sugar or brown sugar instead and how much if it please. Yes you can. You will want to double the amount of sugar as the sweetener I use is twice as sweet as sugar. This recipe turned out amazing! Thank you for creating this masterpiece, Annissa! Side note: I had heavy cream instead of almond milk and it is still A+. I’ve had three servings today and needed to make a strong effort not to have more. Masterpiece? You are too kind! Glad the recipe was a success!